On a beautiful spring day, a young boy, carrying his picnic lunch, was skipping along the soft grass along a dusty road. He saw many people gathering on a hill by the lake just up ahead so, being curious, he took his small sack lunch and decided to join them. His mind was racing with questions as he darted in and out through the crowd, trying to make his way to the front so he could see just exactly what was happening. "What's going on? ... I wonder why there are so many people here... Is it a big party?" were some of the questions going through his mind. He sucked in his breath and scrunched himself as small as possible to squeeze through the thick of the crowd. The boy nudged people to the left and right, and occasionally stumbled over someone's foot as he scrambled through the throng, but he finally made his way to the front where he discovered the reason for the huge gathering. A man named Jesus and some of his friends had arrived in a small fishing boat. The crowd of people was clamoring to get a good look at him. 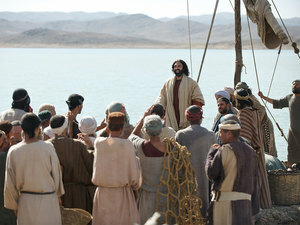 Seeing the great multitude, Jesus and his friends decided to stay in the boat. Jesus stood up in the little boat and welcomed the people. He knew they had come to see him and he wasn't going to disappoint them. The people in the crowd were edging themselves closer and closer so they would to be able to hear what Jesus was saying. Minutes passed and even hours, but the people didn't grow tired of listening to Jesus. They had never heard anyone as interesting as this man. He had so many wonderful stories to tell, and they were hanging on to his every word. As evening drew near, one of the disciples turned to Jesus and asked, "Shouldn't we send them away now? It is getting late, and none of them have eaten anything the entire day." Much to his surprise, Jesus answered him, "No, do not send them away. You find food to feed them." Looking around at the crowd that had continued to grow larger and larger, and hungrier and hungrier, the disciple was a little confused and bewildered. "But, Jesus!" he exclaimed, "There is no way we can feed this many people! It would take about EIGHT MONTHS to get enough food to satisfy this large crowd!" As the disciples looked around the crowd wondering how they would ever be able to follow Jesus' wishes, one of the disciples saw the small boy with his lunch. The disciple knelt down and asked kindly, "Would you be willing to share your lunch?" The boy jumped up and down in excitement and joyfully answered, "For Jesus, I will gladly give it all!" 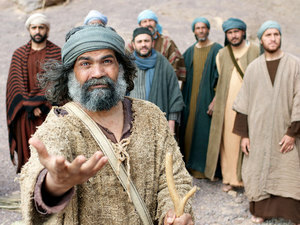 The disciple took the sack to Jesus, and said, "I found a little boy who was willing to give us his lunch. It is small, but here it is." Another disciple spoke up, "There is only five small loaves of bread and two tiny fish in there! How is that supposed to feed all these people?" Jesus didn't take time to explain. He wanted each person to see for himself what was going to happen next. Jesus simply took the lunch; he broke the bread and fish into pieces, and he blessed it. Then he gave it to the disciples, and told them to feed the people. Even though they knew there wasn't going to be enough for everyone, they also knew it was better to obey Jesus than to try to argue with him. They scattered themselves around the crowd and started passing out pieces of fish and pieces of bread. They walked and walked, stooping down to hand the food to the hungry people sitting on the hillside. They were so busy that they didn't even notice that their baskets were not getting empty. Finally when everyone had eaten enough to fill them up and it started getting very late, the crowd started dwindling as people began to go back to their own homes. Jesus told his disciples to pick up baskets and collect all the leftovers so that nothing would be wasted. The disciples were startled as they stared at the sight before their eyes. As they gathered the leftovers, there was a buzz of excitement. "How amazing it is that Jesus could take a small boy's lunch and fill all these HUNGRY people!" one exclaimed. "Yeah, and I've already picked up a WHOLE BASKET of pieces over here!" another yelled back. "My basket is almost full also!" said another with awe. When they finished, they took it all to Jesus and began to count. ONE, TWO, THREE, FOUR, FIVE, SIX, SEVEN, EIGHT, NINE, TEN, ELEVEN, TWELVE. TWELVE Baskets leftover!!!!! Wow! What a miracle Jesus had performed right there before their very eyes! 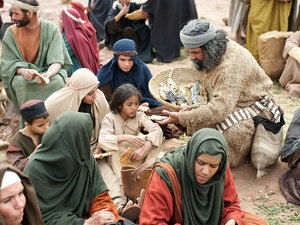 Two little fish and five small loaves of bread had fed over FIVE THOUSAND people with plenty of food to spare! Eight-year-old Kelsey enjoyed helping others. She really wanted to do something that would make a difference. She wasn't very big and she wasn't very strong; so many people didn't think there was much she could do. Some tried to discourage her and told her she had good intentions, but she should just wait until she was a little bigger. Kelsey didn't like that idea at all. She didn't want to wait until she was bigger. It wasn't that she was impatient; she just saw so much that needed to be done and she wanted to help. She saw people to feed and yards to clean. She saw needs nobody else seemed to notice. She saw sad people that she just wanted to make happy, but all her friends, family, and even teachers said that she was too small. It wasn't like she wanted to go around the world! She just wanted to help the people she saw everyday. Oh, but the thought did occur that if she had the chance to go around the world, she wouldn't even have to stop and think! She was out of there! At church on Sunday, she heard a missionary speaking of all the needs in a country far away. Kelsey was sad as she heard him speak because she was sure there was nothing she could do. Then she heard the missionary say something that made her bolt upright and listen with joy. "If you give just one dollar in a month, you could feed TEN people in another country far away." A big grin spread across Kelsey's face, as she understood just what she could do. "I CAN do that, and nobody can stop me!" Now her thoughts were not rebellious, just excited that she COULD finally do something and make a difference. 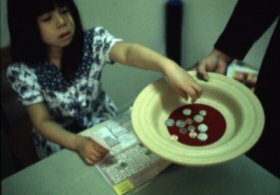 Every month for many years Kelsey took her offering to church to help feed hungry people in a far away country. Plus, she always prayed for the people she was feeding halfway around the world. Kelsey was so happy and almost always had a smile on her face. She learned that she didn't have to be big to help others. Helping made her feel REALLY BIG in her heart. Do you ever feel like the little girl in the story? Do ever feel like you want to help but aren't good enough or big enough? Well, Jesus wants you to know that it doesn't matter how big or how small; He wants to use all of you in an awesome way — not just when you're big, but right now! So why don't we pray and ask God to show you what He wants you to be doing for Him right now? Why did the crowd gather on the hillside? Why did the disciples want to send the people home? What was in the little boy's lunch? What did the disciple ask the little boy to do? Did the little boy want to share his lunch? How many people shared the little lunch? You are never too young to offer your gift to God. "And Jesus said unto them, I am the bread of life: he that cometh to me shall never hunger; and he that believeth in me shall never thirst" (John 6:35). of us something that we can give back to You. a miracle. In Jesus' Name we pray. Amen. Copyright © 2017 by Jennifer Leigh Edwards.